I've been holding off on this post for a few days. This is supposed to be "a daily record of life in a small flower shop", but the record is connected to my other life as well. Here she is again for a last encore. Goodbye My Girl. We'll always love you. Tears in our eyes. She was a beauty and probably such a good girl. I'm so sorry. my heart goes out to you. I am so sorry to read about your loss. What a beautiful dog! UC, Jane and jrush, thank you. She really was a beauty. She was found wandering along a highway in Nebraska when she was a puppy. We had her shipped from Hearts United for Animals. Daisy got blessed with the best parents. Such a sweet girl. I'll always remember how sweet she was when she played with her beloved ball the time I watched her and blossom. That made me tear up. 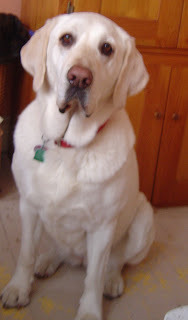 I lost both of my labs recently and my Gracie just 6 months ago. I know how hard it is to say goodbye to them. She looks lovely in that photo. Rasmataz! aww, this makes me tear up too. Labs are so upbeat and eager for everything, even towards the end. I know how much you miss them. Webb, thank you. I love to think of doggy paradise reunions and making new friends to run and play with. Mocha and Daisy and Gracie and Pickles and Blue and William. Dogs keep the Cynic in me softened. Roses and Roses for all!